Following directly on from the previous episode, Elementary Season 4 Episode 22 dealt with the death of Emil Kurtz, the mole who Joan had blackmailed into working for her. 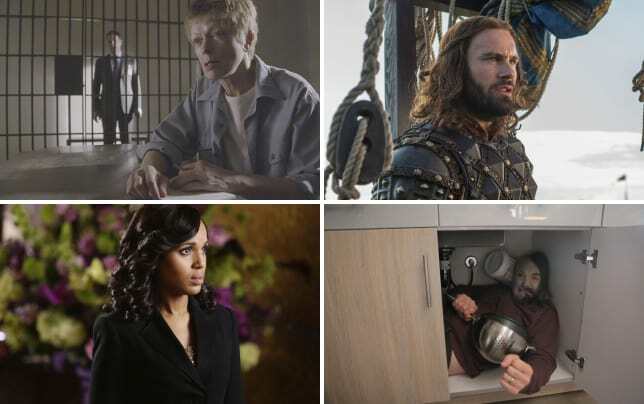 This episode featured some excellent performances, coupled with a whopper of a reveal at the conclusion of the case which will no doubt play into the final two episodes of the season. I do have some problems with this episode. For example, Joan showed little to no guilt about whatever role she may have played in the death of Emil Kurtz. She was blackmailing the guy! Why didn't anyone seem to have a problem with this? Except for Morland, and not because of any petty moral considerations. It sure was convenient that one of the victims of the diner shooting was allergic to that one thing (mountain lion!) that led them right to the assassin. That smacked of lazy writing, which is really too bad. Jonny Lee Miller and John Noble really were quite good here, and I also enjoyed Aiden Quinn's Captain Gregson facing off against Morland Holmes despite the fact that it was almost definitely a Really Bad Idea. The Gregson-Morland scene actually provided for an intriguing contrast between the two characters in their relationships with Sherlock. Despite being Sherlock's biological father, Morland shows very little affection for his son. If he does actually love him, it's couched in very cold, logical, and manipulative behavior. If anything happens to them, the next time you see me I won't be a cop. Permalink: If anything happens to them, the next time you see me I won't be a cop. Sherlock, for his own part, greatly respects Gregson, which is one of the reasons he filled him in on his suspicions regarding his father's involvement in Emil Kurtz's death. The fact that Sherlock is so quick to believe Morland's involvement should tell you all you need to know about that relationship! I do think that maybe Gregson probably shouldn't have threatened Morland Holmes to his face, though maybe Morland respected the audacity? courage? strength of will? of the good captain, knowing what he knew about Morland and confronting him anyway. I was incredibly pleased when our heroes decided to talk to each other (first Joan to Sherlock, and then Sherlock to Gregson) instead of just bumbling along on their own as too often happens on shows like this, as if only they can solve some problem on their own. But the big news of this episode was Sherlock's declaration in the closing moments as to the identity of the person behind the tangled web they were attempting to unravel: none other than Moriarty herself. She was last seen (well, heard) in Elementary Season 3 Episode 14, "The Female of the Species," and it's clear that the devious Napoleon of Crime still has a thing for both Sherlock and Joan despite being locked up. 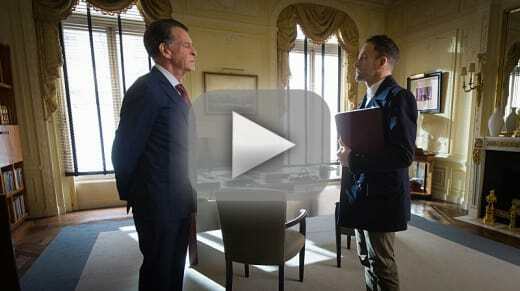 Is it possible that we're headed for a Reichenbach Fall here on Elementary? Moriarty, like her literary predecessor, has a penchant for complicated plots, wheels within wheels and all that, though I do hope that the writers don't make everything so complicated that we the viewers are totally unable to follow what's going on! I confess that I wasn't able to get down some of the best quotes from the episode, unfortunately. What were your favorite lines? Sherlock's mother was brought up again. Something tells me that while Morland may have been telling the truth about looking for the ring, he was almost certainly lying through his teeth about the reason why. Dante Alighieri is best known for his Divine Comedy, most especially the Inferno portion. It's worth noting that the ninth and final circle of Hell in the work is the circle of treachery, the punishment for traitors. I would probably eat cooked cockroach before moldy fruit, but just plain gross, all the way around. Great scene, though, especially with the look on Lucy Liu's face as Sherlock's putting the items on the table! So, what did you think of "Turn It Upside Down"? Were you surprised at the Moriarty reveal, or did you see it coming? Did you think that Morland was behind the hit on Kurtz? Let us know in the comments section below! If you missed this episode, fear not! You can watch Elementary online to catch up. 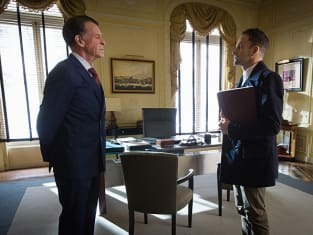 Be sure to check back for our review after Elementary Season 4 Episode 23, "The Invisible Hand," airs on Sunday, May 1, 2016 at 10/9c on CBS!